Hosted by Bryan Adams PTSA proceeds from the race will benefit all Bryan Adams students and teachers by helping fund projects to promote the growth of our school and enable us to provide items and services not completely funded by the district. This year, we are raising funds to support student assistance, provide teaching supplies, fund school beautification and encourage social events for students, parents and teachers to promote a sense of family within our school. **GIFT OPTION** - Please consider supporting a student who cannot afford to sign up. Chose "Buy a Gift" on the right of registration, you can 'buy the gift of registration' for a youth. You receive a code for that gift. Please email the 'gift of registration' to racedir.cougar5k@gmail.com, and the race committee will distribute the gifted registrations to students in need eager to join the event. Thank you in advance for your generosity! 5k - 4 Team Memebers : Fast combined avergae time per team is the winner! Parking is in the lot adjecent the Baseball field and CAN ONLY be accessed via Peavy. Parking is available at Howard Stone Park and Kiest Elementary located across Ferguson on Millmar - a short walk to the start line. Dallas PD will be monitoring the safety for the event. Barricades and Cones will start being placed around 6 am espcially for Start area on Millmar Drive blocking access from both Peavy and Millmar as early as 6am. 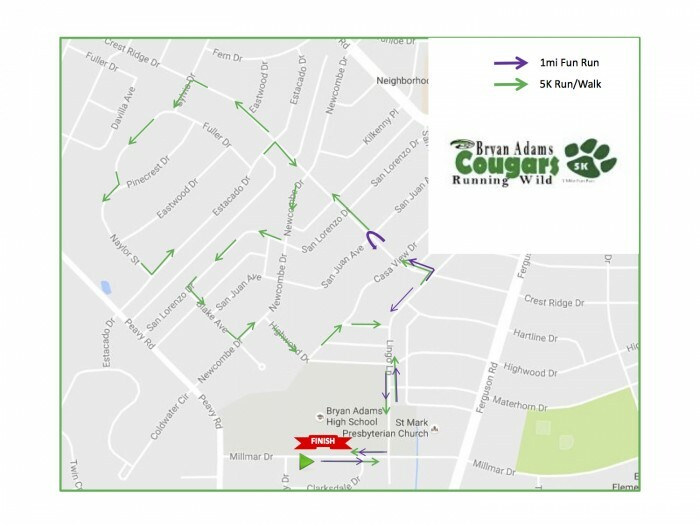 The run follows the course within the neighborhood along Lingo Lane Crestridge and then winds around the neighborhood via Pinecrest Naylor Newcombe back to the school- see map below - access and egress will be blocked/limited along the course monitored by Police and Volunteers. Access from Gus Thomason, Peavy and Ferguson will be limted based on which access route is used once that route meets the course.